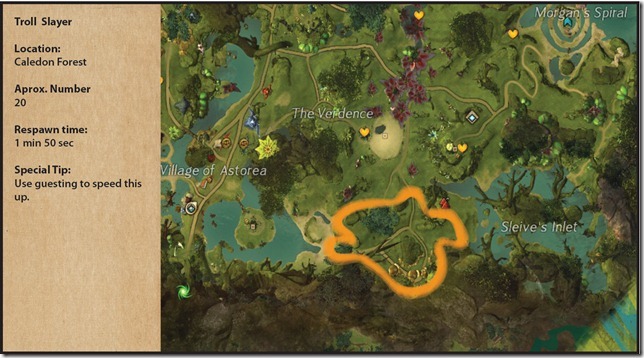 A guide to completing the Slayer Achievements in GW2 with maps and instructions compiled by Evelyn Firstborn. 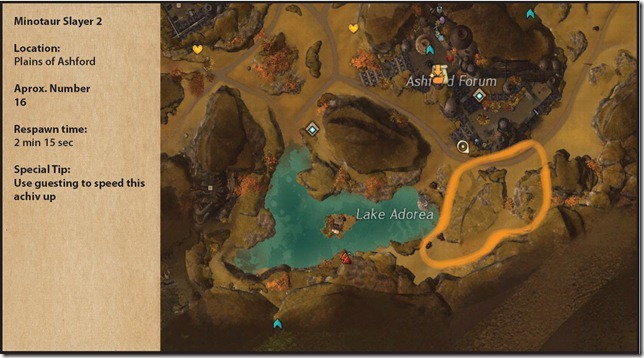 The guide was written and created fully by Evelyn Firstborn (Korny.3168) e-mail: korny66@net.hr (EU server) so if you have any feedback please direct it to him. First all, I must thank Dulfy for posting this in my name and for her help and support in the past. I must thank Aleph for spellcheck and endless compliments : ) Neladia and Agenciq for their endless support and laughs we had on skype. Also Xerger, Vuul and certain members of Whitelions [Claw] guild from Desolation for helping me test Giants. Most of this guide is aimed at solo play since creatures are in most cases are very low level. I assume if people are doing these achievements they already have done plenty of things in game. Don’t start pushing these slayer achievements early in game since you will encounter a lot of creatures throughout game. Do them in free time while you wait. 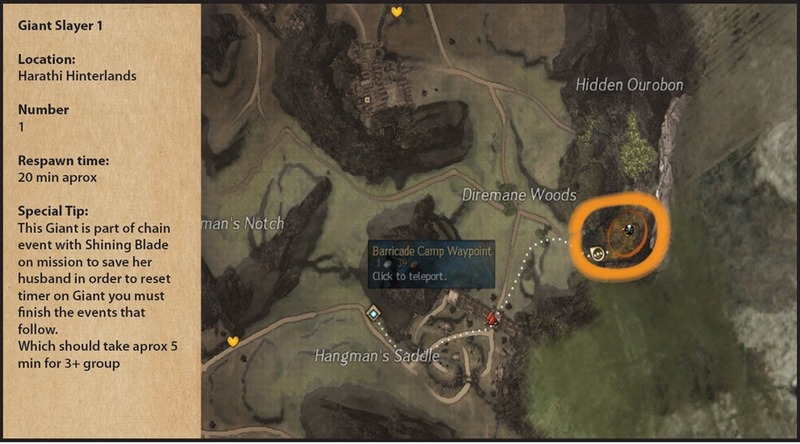 A lot of locations are close to World Bosses due the fact that alot of people are camping the bosses at spawn windows and are left doing nothing. Use the time to get few achievements if u want. My advice in order to be fast and efficient is using maximum dmg output it doesn’t matter which profession I myself used to use Warrior, Elementalist and Guardian for most of these. Use guesting and jump from server to server. 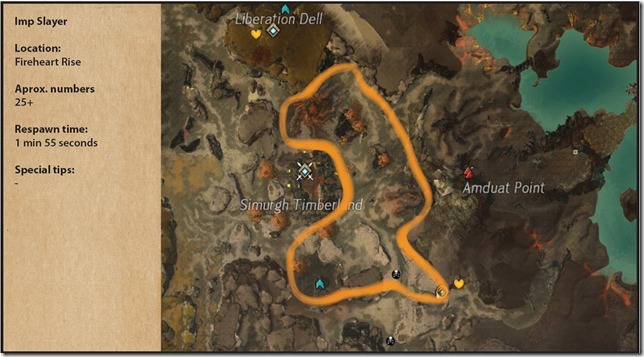 Using this technique will speed up the achievement process very very fast since you won’t have to worry about respawn timers. 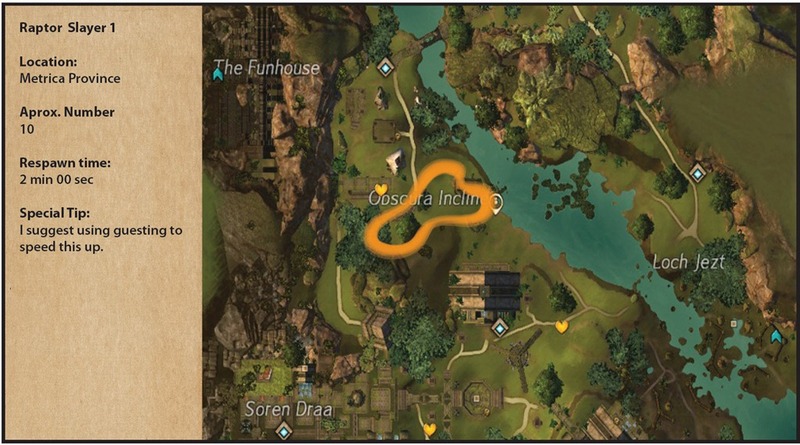 I expect people will start using these locations more often as they become aware of them and you might find other people close to you also doing them. 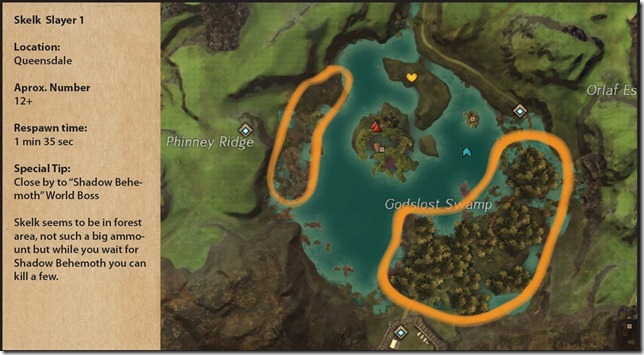 With some achievements you can group up and do them together but most of these creatures are low level and are meant for soloing. Don’t kill 500+ at the same time do them slowly or you might as we say “burn out“. Let up some sort of time window or kill window. Like 100 kills per day or 20 minutes per day. 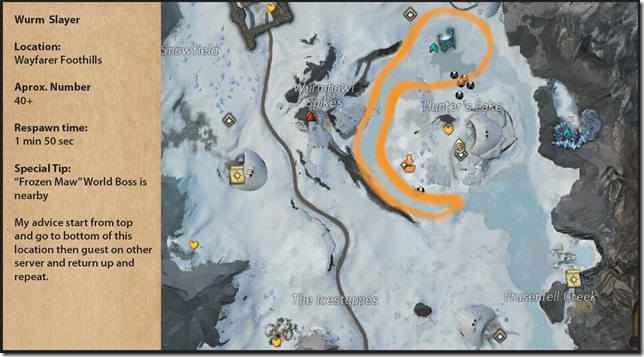 Try to coordinate your slayers according to daily. If daily say 40 Shiverpeaks kills go kill 40 kills from this guide located in Shiverpeaks area. While you are doing Slayer achievements use weapons with which you DON’T have 5000 kills with. There 39 Slayers to be obtain that means at least 39 000 kills that means you can “easily“ fill in 8 Weapon Masters There are currently 19 Weapon Masteries you can obtain. Try to focus using weapons you rarely use on these achievements. Plenty of people will ask “Hey how am I supposed to get Shield mastery or Torch Mastery“. For those 2 I suggest checking Indiscriminate Slayer part of the guide with a good location to getting those. Centaurs can be found in every Kryta region in high population so you are definitely gonna get them in time. 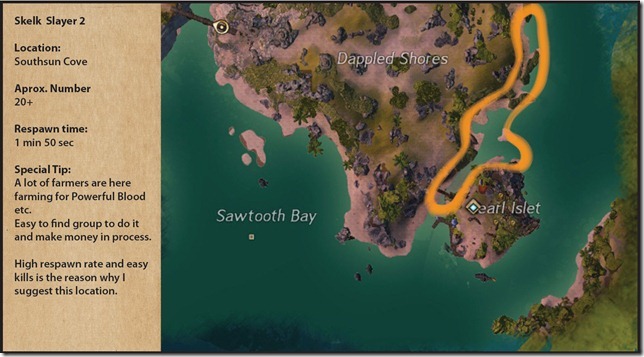 Drakes can be found in almost every region in game. Just to remove confusion Risen drakes don’t count towards Drake Slayer (they count towards Risen Slayer). Basilisk can be found in few regions and they counts towards Drake Slayer. 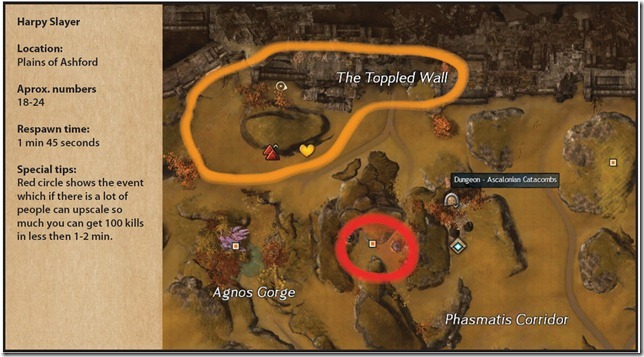 Harpies are mostly located in Ascalon regions with the exception of one small spot in Queensdale, a small spot in Eternal Battlegrounds next to Ogre camp and the “Harpy” or “Raving Asura” fractal. 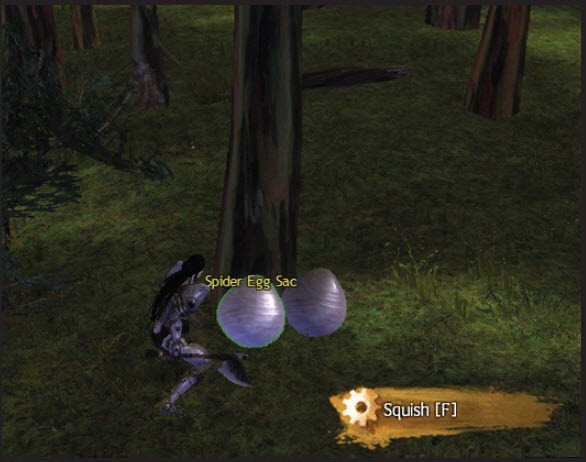 Spiders are widely spread across Tyria, incorporating different attack patterns from melee to ranged damage with some annoying pulls, immobilizes etc. Bandits would be the closest “nemesis“ figures to the human race. Similar to Flame Legion, Sons of Svanir or the Inquest being the nemesis counterparts to other races. Players playing the human race will likely encounter quite a few of them in their leveling. 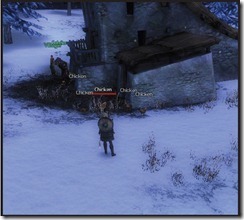 Caudecus’s Manor (CM) dungeon will also contain plenty of bandits for those looking for more group content. 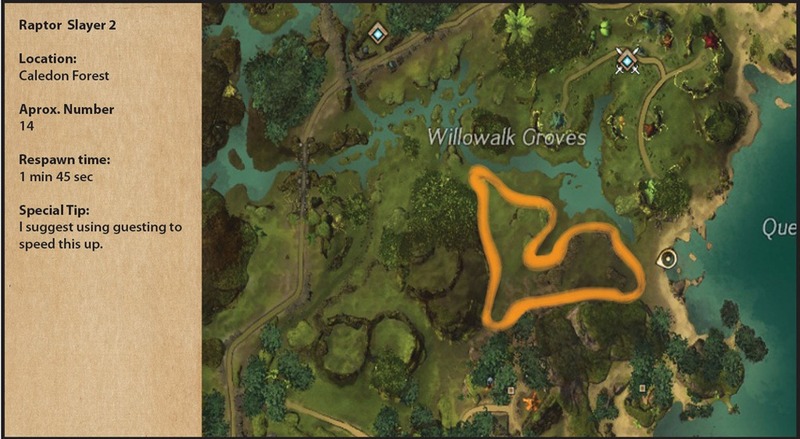 Most people have special tactics with this achievement (like having 2 characters on different spawn places and relog on both as not to waste time waiting for respawn) but after checking multiple locations it would seem that the famous graveyard is still the best location to do it. Shell slayer can seem difficult but the fact is that most people just ignore these creatures while exploring. They never attack you and have regen and blocking ability so people just skip them. 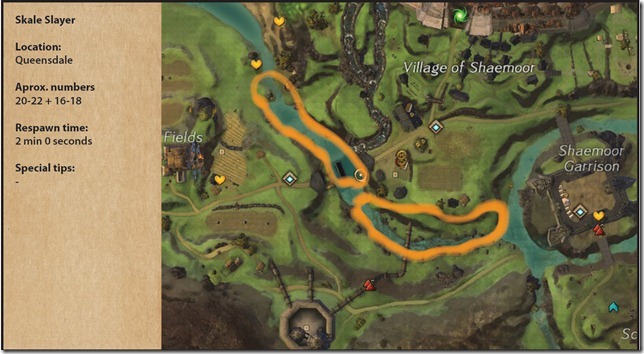 Almost any location is good for farming these slackers. I personally prefer this one because you can run in a circle and there is a decent amount of them. 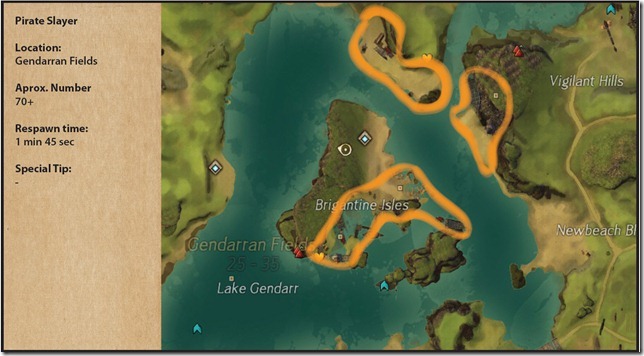 Also don’t forget to kill the ambient crabs as they also count towards achievement. These scorpionish creatures can be found all over Ascalonian regions. Since I spend a lot of time in dungeons I was able to hit this achieve pretty quickly doing Citadel of Flame path 2. The Dredge…everyone I know hates them. In my opinion one of the toughest creatures in game. Most people face palm when they get them in Fractals or anywhere. 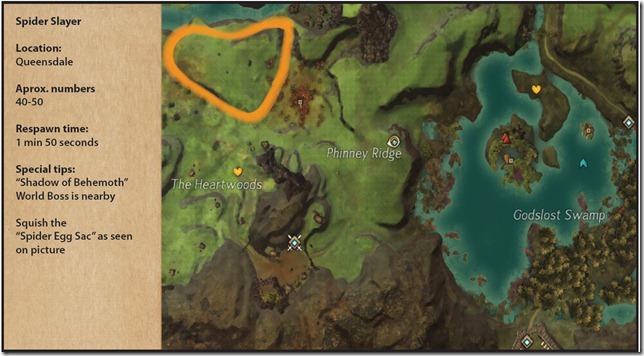 Elementals are everywhere in more or less every region. Most people at some point will get this achievement completed so don’t bother hunting for them. Most people usually avoid these guys due to their high HP and their knockback ability. Here are two locations to farm them for the achievement. 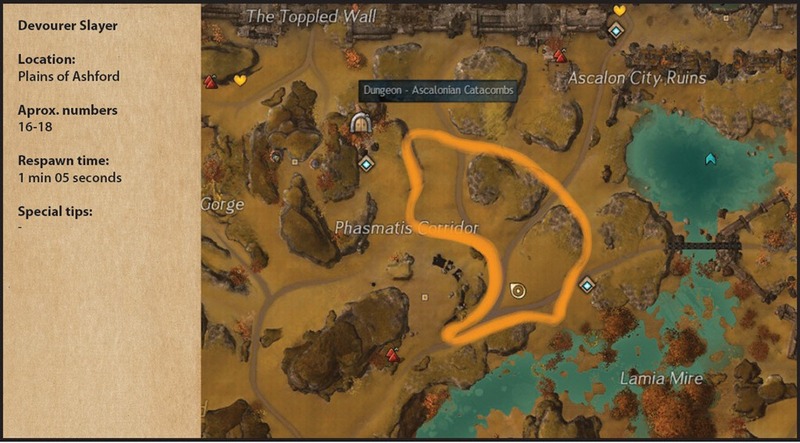 This achievement is very easy if you visit Ascalon Catacombs (AC) dungeon. 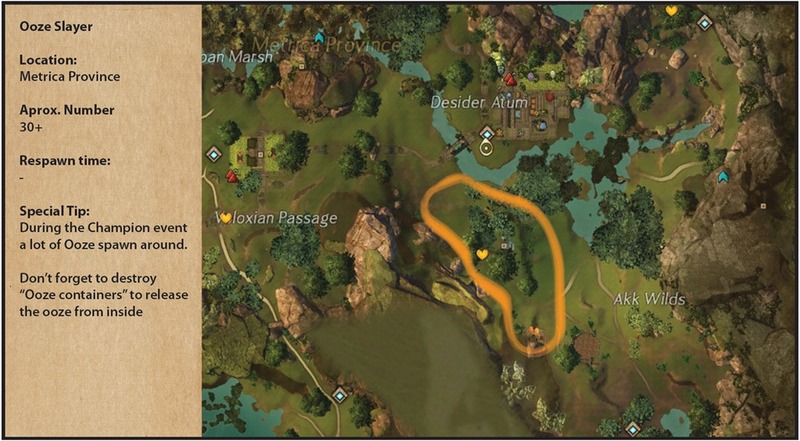 As a starting dungeon I would advise going there since the tokens can also be used to get some good gear very quickly along with leveling up your character. 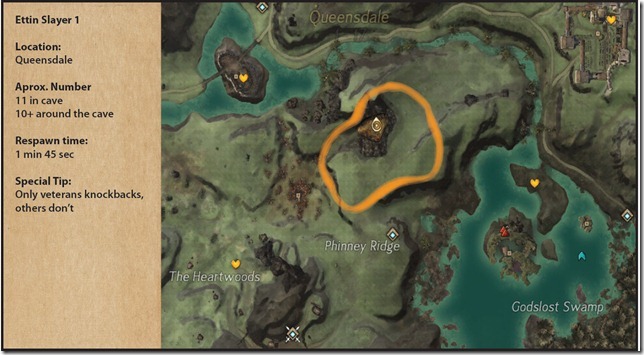 So in my opinion don’t bother looking for ghosts in Tyria better hit a few runs in AC and get it done fast. Alternatively you can just run around in Plains of Ashford since 75% of the map is Ghost infested you should have no problem doing it. Well as of this point I’ve finished my research related to this topic. I’ve seen on reddit and a few forum topics this practice being used by some people so it’s nothing special and new but I will share this information with everybody. 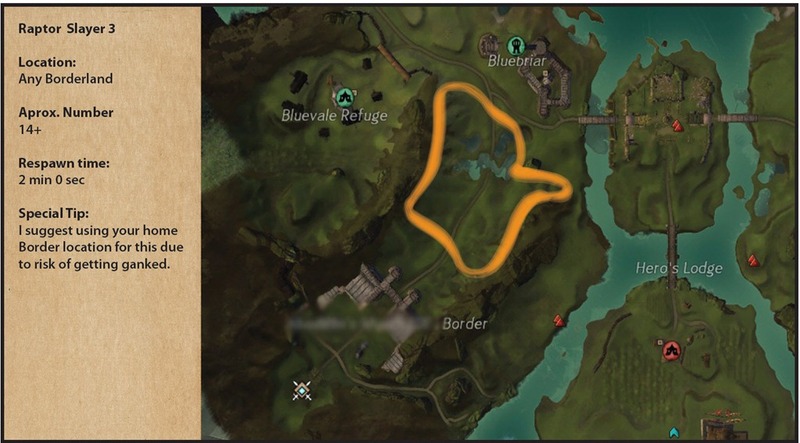 I also encourage people to help each other (including me) to make this achiv possible. First I’m gonna list some information related to this achievement. Risen Giants DO NOT count towards that achievement. There are only 3 locations where Giants spawn in Tyria. 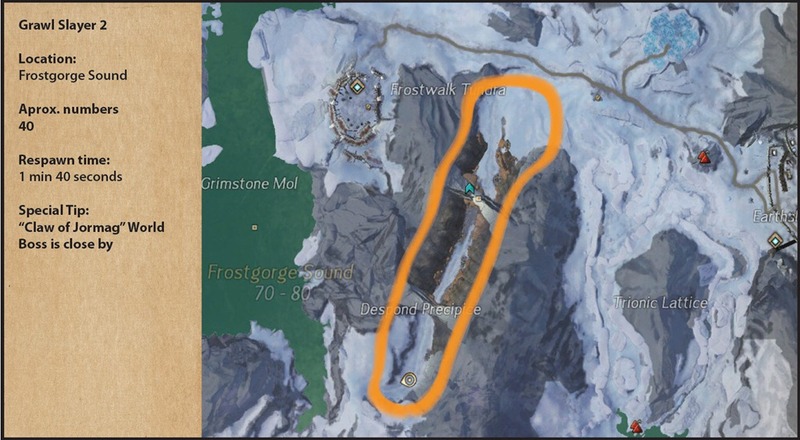 The first 2 locations contain a Champion Giant which, lets get real is a pain to kill and requires bigger groups to make it not so time consuming. 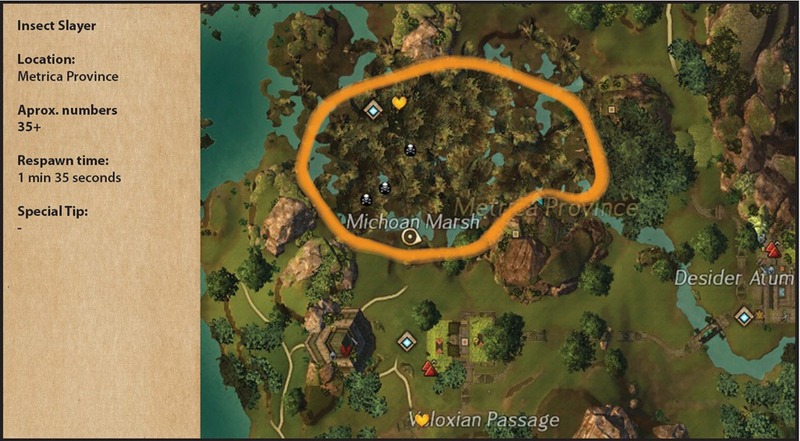 Here in Brisban Wildlands there is an event called “Broken Golem“. He is on his mission to save his Asuran creator. After a brief self dialogue he begins his first encounter with a normal non-veteran/non-champion Giant which is can be easily killed by anybody. This giant counts towards Giant slayer and on top of all that when you finish or fail, the Broken Golem event restarts a 6 minutes after. However, that is not it. 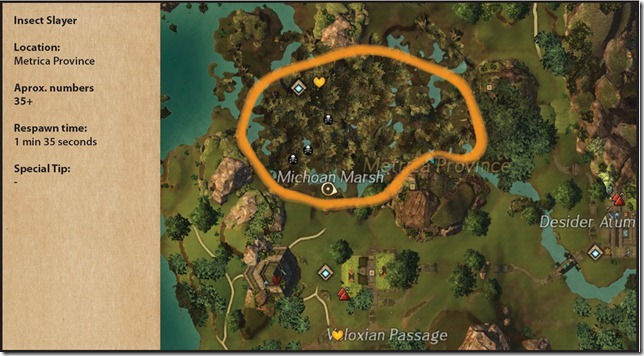 To my big surprise when you bring a friend and do this event with 2 people 2 Giant will spawn.I tested with 9 people and we got 4 Giants and some say that with 20+ you get 5 Giants spawning. I have started a Giant Slayer Guild whose sole purpose is to group people with interest in Giant slaying no need to represent or anything just join Guild so people know they can whisper you “Hey wanna go in group with us?“ If you want an invite contact the following two guilds. Now I am going to explain why I want people to join a Guild to make this more easy to get groups. Form up a party with 5 people. Try to aim people from 3 different servers max. Everybody in group guest to those 3 servers. 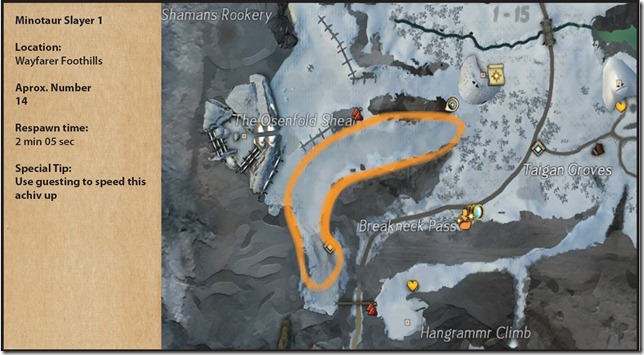 The Grawl are present everywhere in Shiverpeak Mountains and most people get this achievement fairly easily by farming these grawls. 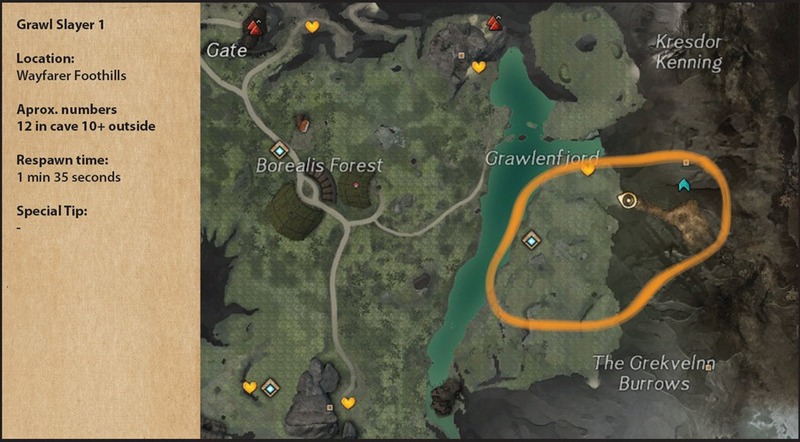 The first location is easy low level area with plenty of Grawl. 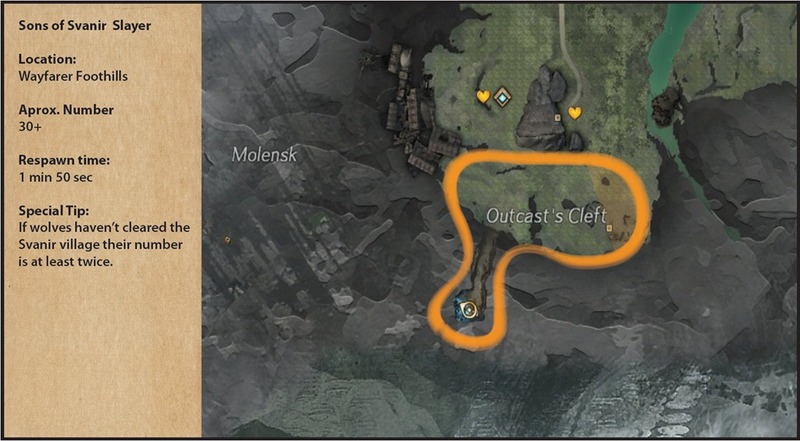 The second location, however, is more popular as it is very close to Claw of Jormag and they drop very nice loot. Also expect Grawl to be present fairly often in Fractals. 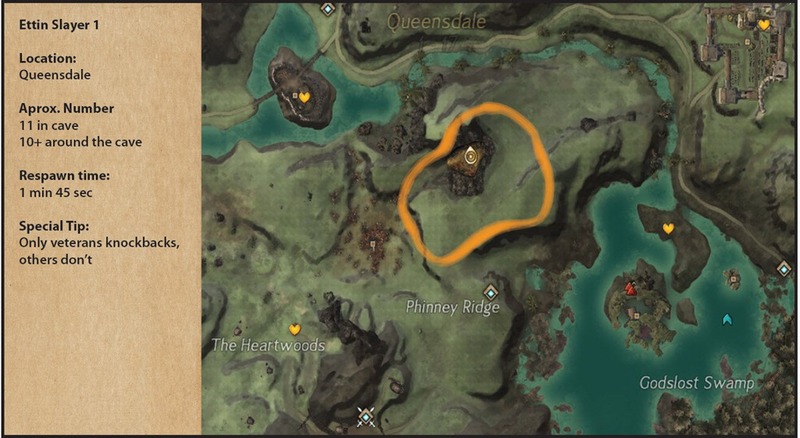 In my experience most people avoid these beasts due to their ability to evade and knockback but it should be very easy to complete this achievement at this location. The griffons here have a high respawn rate and are all low levels so they don’t use their high level abilities. The Hylek are usually peaceful but they have several attacks they make them a pain to fight: heavy conditions, stuns and evades and their risen counterparts are even worse. 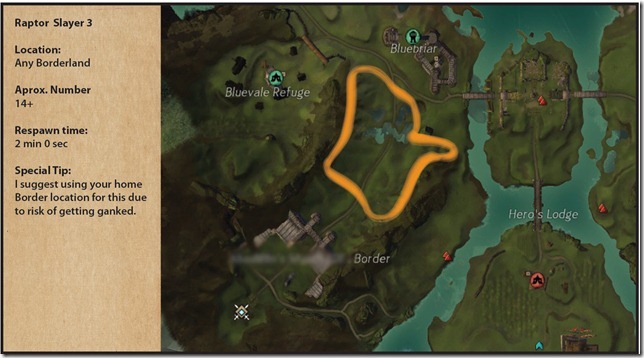 This location on the other hand make this achievement very easy to obtain. Risen Hylek don’t count towards Hylek slayer. 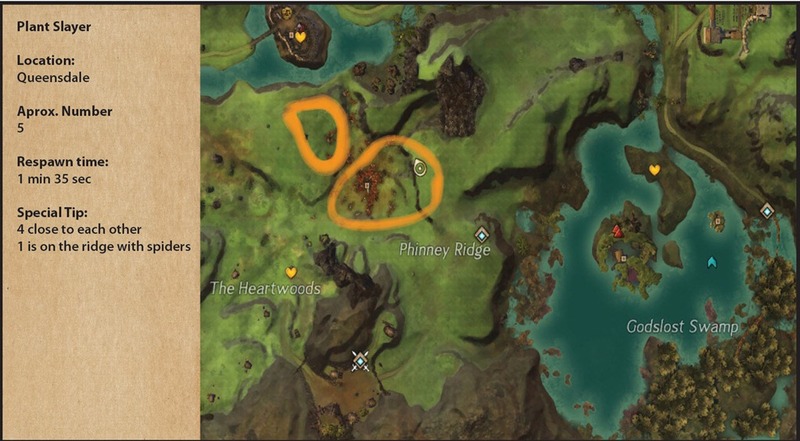 The Flame Legion, nemesis of Charr and residents of Citadel of Flame (CoF) dungeon are one of the most easy achievements to obtain. Living story has accelerated this achievement even more so I’m just going to use this picture as motivation towards it. Almost everything underwater except crabs and kraits are considered as fish (Barracuda, Shark, Jellyfish, Salmon, Tuna, Armored Fish, Wave Rider and similar variations to these names). Place to get them? My advice would be Underwater Fractal. On last boss there are endless waves of Jellyfish you probably kill 50-100+ per run so few runs of those should get you this achievement sooner or later. Since daily’s often require underwater kills these should help you progress quite fast. These guys are present everywhere and yet nowhere. Imps are often summoned by Svanir or Flame Shamans and in most cases those summoned Imps count toward the achievement. I personally killed most Imps farming CoF path 1 (on acolyte part), but I can’t expect everybody to do that. 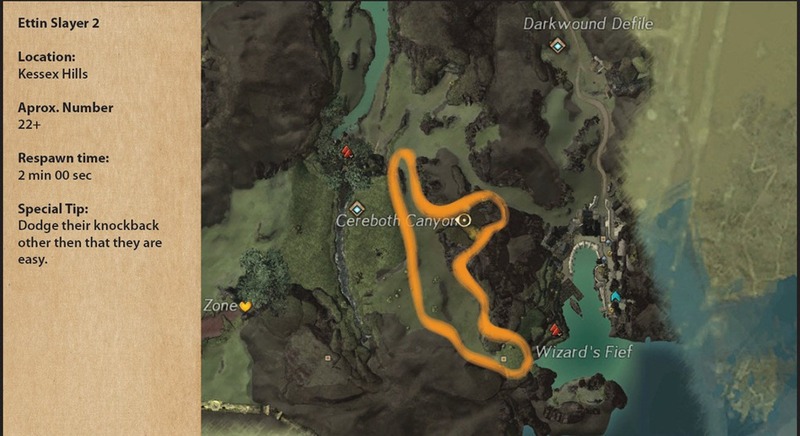 So I’m gonna suggest this location if you really wanna speed it up. Inquest are present in dungeons and Orr. 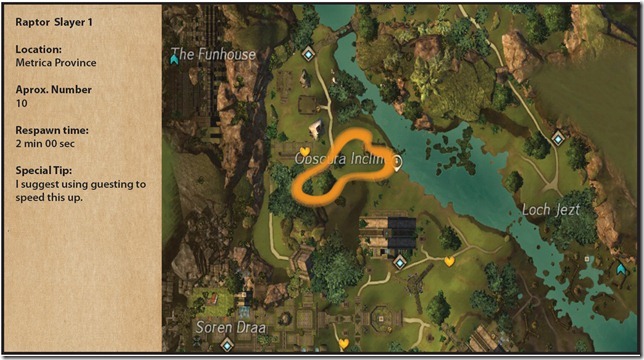 However, people often neglect them or find them too annoying to fight thus making this location your new hotspot for obtaining the achievement. Insects are everywhere as in real life they stick close by to water or swamps. 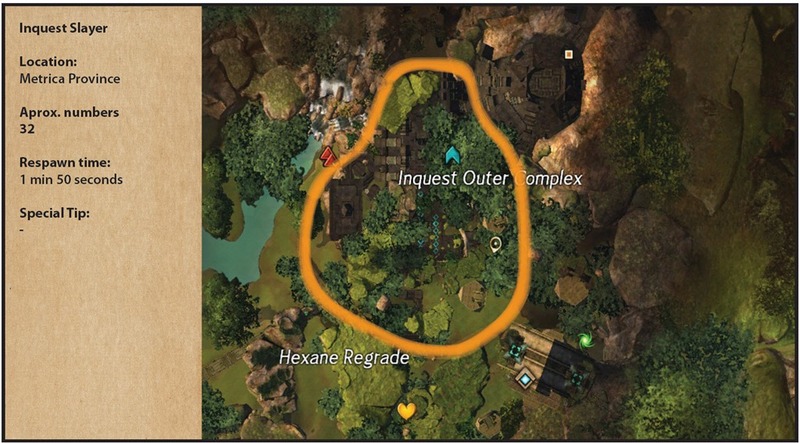 I found this location great due to making a circle around the Hylek village and large amounts of insects are present. The ancient Jotun race is hardly seen in these Tyrian times and are on side pages of main story thus most people tend to ignore them. 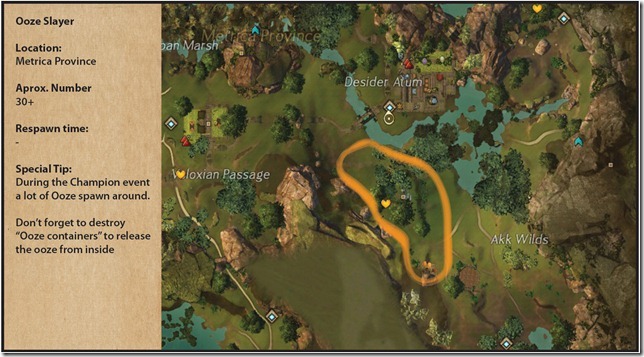 They aren’t difficult enemies and these locations shall give you achievement very, very fast. Both underwater and shore menace with high variety of skills makes this creature very annoying and I’m sure some people still remember trying to get that vista in Nonmoa Lake in Timberline Falls and facing constant pulling and knockbacks. Krait are everpresent in almost all regions in Tyria. They appear in multiple occasions in personal story quest as well as the “Underwater” fractal and sooner or later you are going to get this achievement, because like it or not these creatures are everywhere. 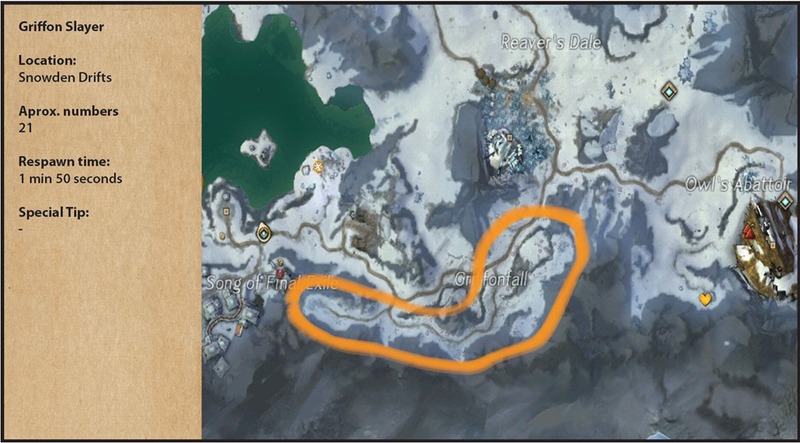 Use this location if you want to speed it up a bit. 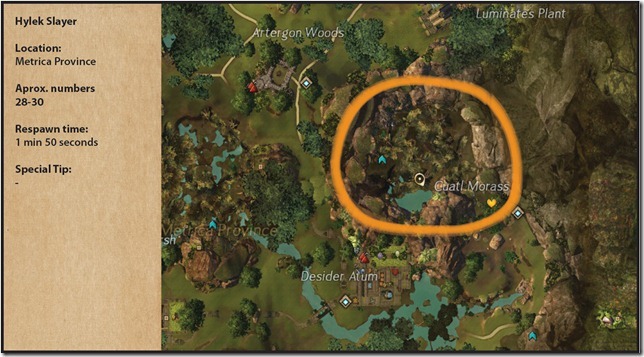 The Minotaurs are barely present in Tyria. 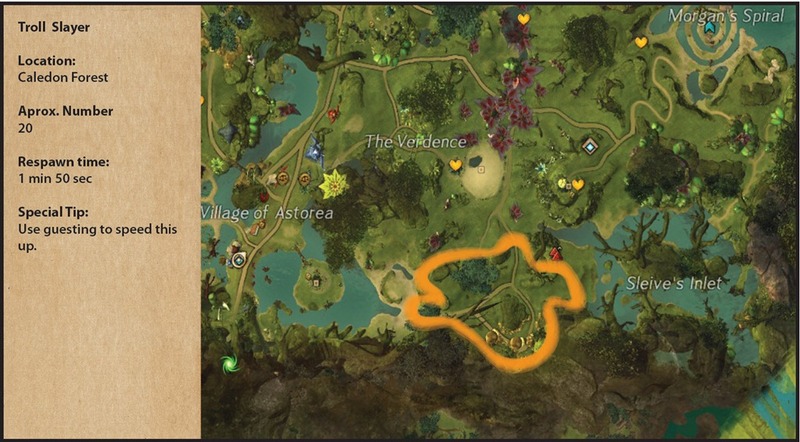 They can be found in some locations in Shiverpeaks and Ascalon area and in some personal Norn storylines. These 2 locations should speed you up and guesting is advised to make it faster. 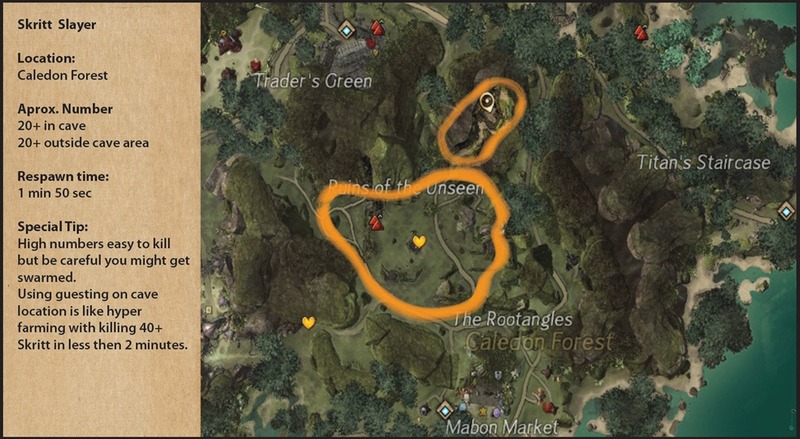 Use this location to complete it nice and calmly. The big creatures with pets can be a real menace and most people just kill Ogre’s when they do tasks in Fields of Ruin and in Blazeridge and never return. 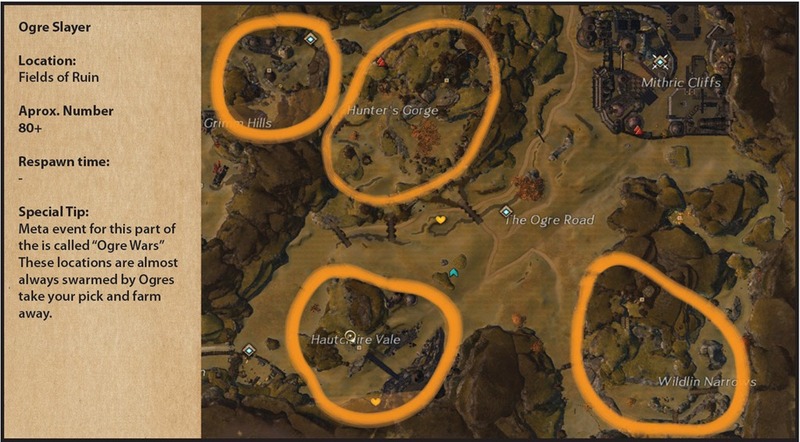 These locations in Fields of Ruin are the best to achieve it due to high numbers and fairly low level. So my advice is use this location to farm ooze and try not killing the Ooze champion when he is there as he spawns endless ooze. Pirates are normal in higher lvl Krytan area’s like Gendarran Fields and Bloodtide Coast and aren’t hard to find but in this location the concentration is at it’s peak with over 70+ pirates in a small area. Don’t forget to bring rum. The Plant slayer is in my opinion at the moment the slowest slayer achievement so don’t rush it. In order to obtain you must slay plant like creatures like walking Ent’s such as “Oakhearts“, “Pinesouls“,“Mosshearts“ and Husk’s. In 90% of cases all of these creatures are veterans and aren’t too hard to kill but there are so few of them. These guys are probably the most neglected slayer achievement (not including Giant one) since you rarely have to kill them for tasks, events or even in personal story as you usually can just run past them and ignore them. 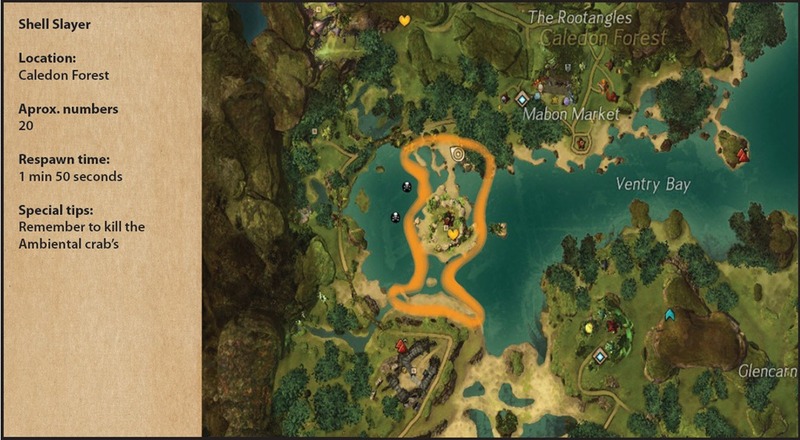 My advice is using this location and after clearing, guest over to some other server and clear again. Return, rinse, repeat and that should really speed up things a bit. People often mix Skelk with Skale on first sight, main difference is that Skelk stealths and attacks suddenly from shadows. You often encounter them in world with their thief-like need to gank you. Most people usually have plenty of kills. That’s why I suggest these 2 simple location to fill up your Skelk slayer bar as you go. These rat like creatures in their endless pursuit to find shinies are mostly friendly in Tyria. The hostile ones can be a real menace due to their pack-like lifestyle, often swarming you in groups of 5-6+ Skritt so take caution. A lot of people were able to finish this achievement during the Wintersday events. The nemesis of Norn’s, the Son’s of Svanir’s are present everywhere in Shiverpeaks area, in Norn personal storylines, Honor of the Waves (HotW) dungeon and in “Snowblind” fractal. 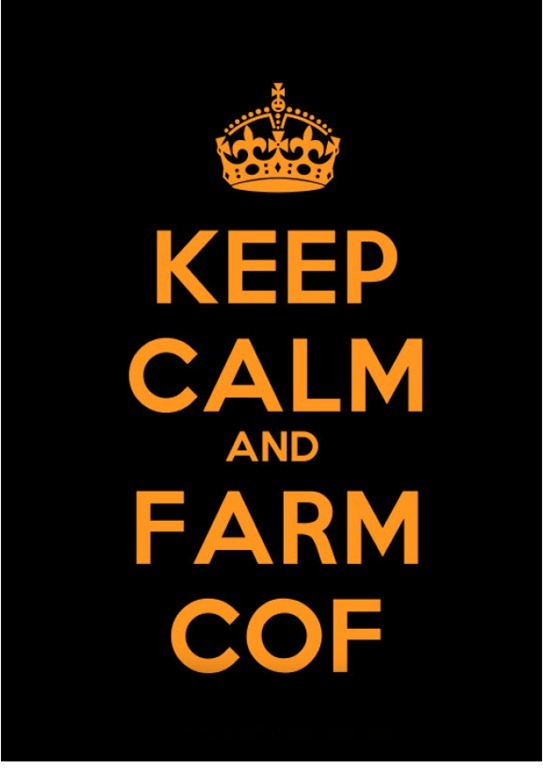 In most cases you don’t need to farm them due to their high world abundance. But in case you are missing few use this location to blitz that bar to the max. 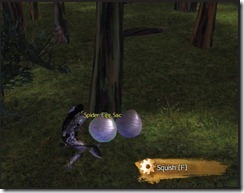 Trolls are fairly easy to obtain since a great number of people have farmed them or continue to do so in Frostgorge. 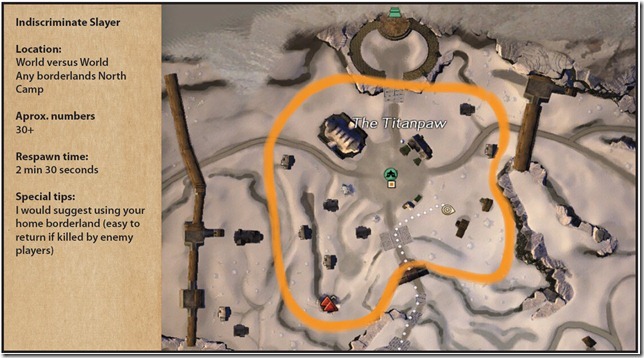 Using this location will get your slayer filled up very fast and with addition to guesting you will get this done very painlessly. The Wind Riders are creatures resembling a levitating octopus or some kinda of Cthulhu like creature. 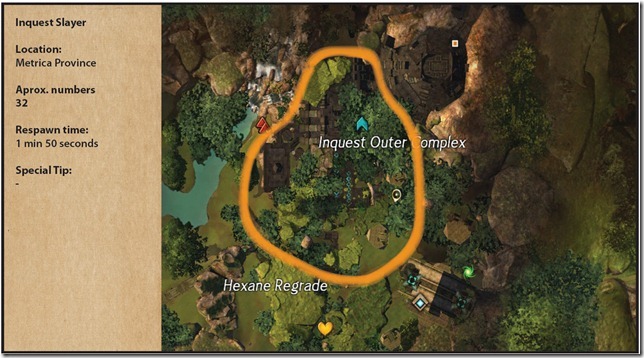 Most people who don’t skip mobs in Bonus fractals have fairly high amount of kills but for those who prefer skipping I suggest this location to max the bar. 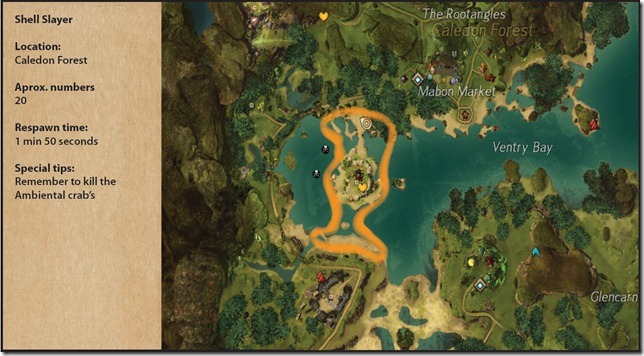 The achievement is fairly simple since you encounter plenty of Wurm in Tyria. This location should help you if you want to speed it up. 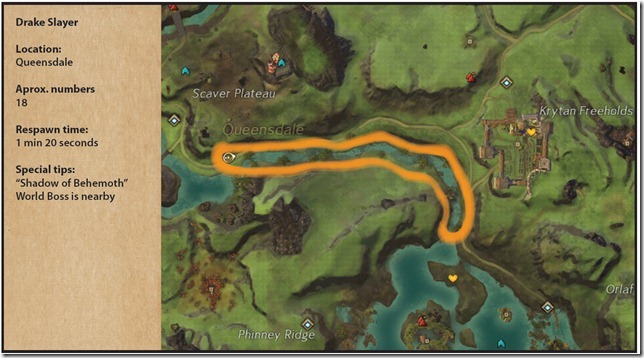 Zhaitan’s Bane is very simple and is usually the first slayer achievement most players obtain. Since current personal story and end game zones are filled with Risen you will probably kill over 50 000 in few months so don’t worry at all with this one and just enjoy the show. 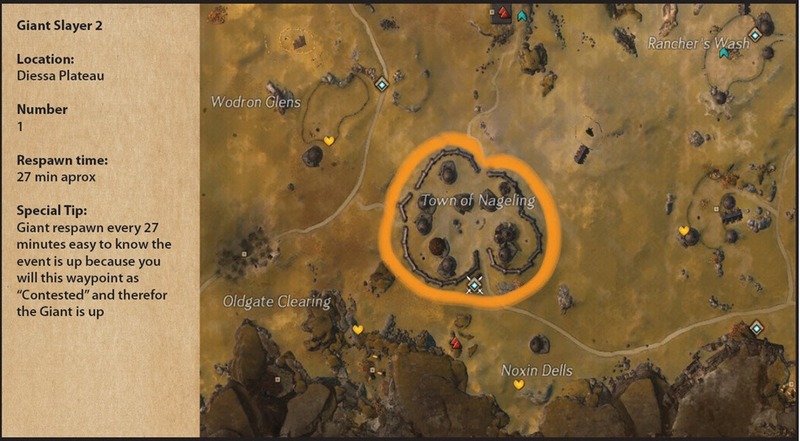 Would be interested in joining/forming a guild for giant slaying. Just as a note, risen vultures actually count towards vulture slayer. The Melandru temple chain has a bunch of spawns at the last few parts. Thanks! Very good work on gathering intel. Awesome, as always. 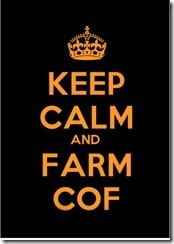 Hahaha, keep calm and farm for CoF. Go solo in the Swamp fractal and kill spiders / skelks there, very fast respawn and way faster than places in the guide! Well if I recall people used to farm those and they removed loot so and we are talking about lvl 80 creatures don’t see how you can kill lvl 80 faster then lvl 5-6. Respawn time is really good in Swamp but only that if you gonna put small effort in killing lvl 80 mobs might as well have some drops if u ask me. Giant Slayer: final boss of Crucible of Eternity (story) counts for the achievement. This is a really good guide, but, I’m missing something… why do these slayer achievements? Why should I do them? For the shell slayer you can also kill the little white crabs which appear next to the hermit crabs. Plus, the crabs are best killed from range, they only start blocking when close to the attacker. “Defeat the brimstone imp and summoned imps” in Lonars Pass, North of the Cascade Bridge Waypoint is a far better way in my eyes instead of the highlvl fireheartrise area. When the golems picked up enough essences from the ice imps, which u killed with an equipable gun and you use the interface near the asura on an essence, a verteran brimstone imp will appear. This imp is immun to attacks as long as its summoned servants are alive and he re-summons them always. Furthermore you can simply run away to make him reset(full life again), he is a verteran so he wont die just from some hits. 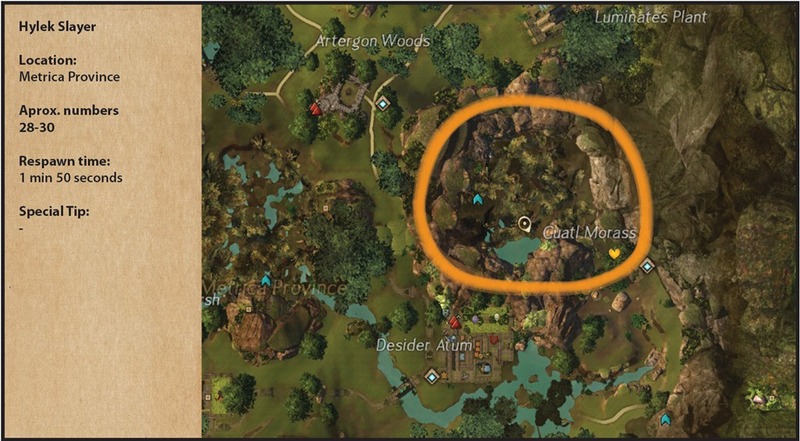 In addition to that he spawns an “altar” if this happens dont destroy it. This altar also spawns 3 Fire Imps like every 5 seconds in addition to the normal summoned ones which are 1-3. All these normal fire imps die after 1-3 attacks. Health regen food might be a good choice, even me as a guardian ran out of HP after maybe 10 attacks. So keep your health bar in mind. 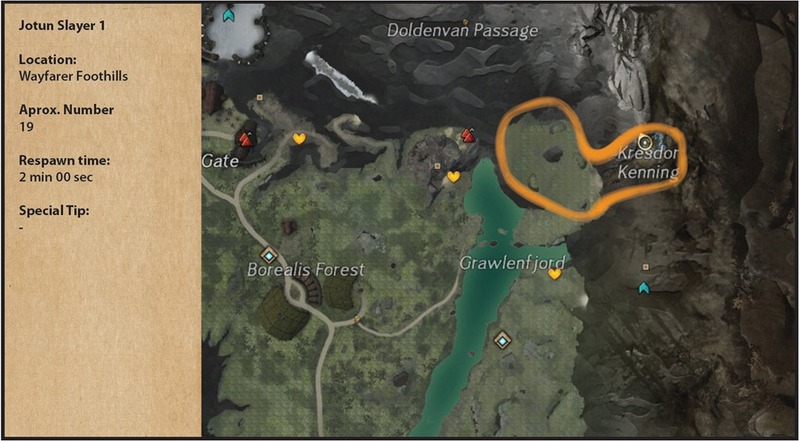 Another lower level place for imps is in Dredgehaunt Cliffs in Kolkorensburg next to the Hessdallen Kenning waypoint (slightly southwest from the entrance to Dredgehaunt from Hoelbrak). 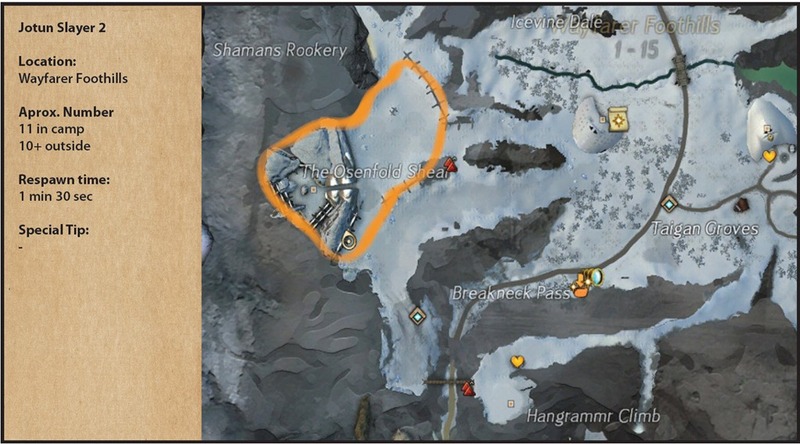 There is the event “Retrieve containment crystals from skritt and return them to Scholar Dane” that spawns Phantom Imps (level 41). If the event is up, you can just go back and forth, there are about 15+ imps and they respawn quickly. Unfortunately, it does rely on having the event active and no one else completing the event while you are there. Worth checking if you are working on this achievement. 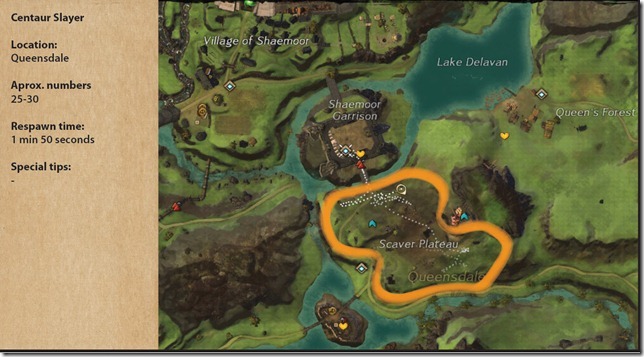 For Insect I also suggest in Queensdale ~ Ojon’s Lumbermill Waypoint, and go east. You’ll find plenty of wasps and wasp nests and if you are lucky you will find also Wasp Champion Queen event that spawns several wasps in the meantime of fight! 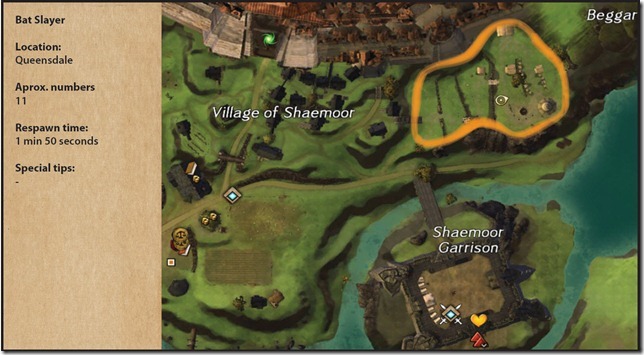 Skale density in queensdale has been reduced. Try southeast corner of Plains of Ashford instead. 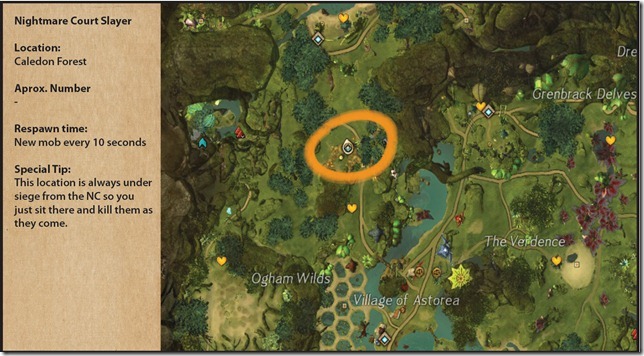 Grubs count for wurm slayer, try the grubs in the champ troll cave in queensdale. right on. Ascalon basin is much better to get skale slayer. the density is three times as much and respawn is faster as well. Hydra Queen is a pirate captain event on laughing gull island in bloodtide coast if i recall correctly. Her event can be a little bit of a pita to get going, or atleast it was last time i killed her. Goodluck. Still is had to do the first part of the chain 3x to progress the story. Make sure you look at wiki because there is another event you need to have done to get the chain started. 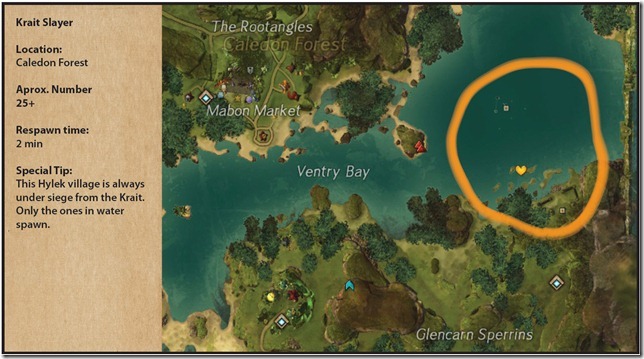 Found another excellent spot for hylek slayer south east of the loch waypoint there is a non-aggro but attackable village of hylek. There is about 25 if you run the whole camp (both sides of the stream) and they are only lvl 3 so they die rapidly (i was one shotting them with a shortbow thief) and their spawn time was fast enough that by the time i finished the full camp they had reset back where i started. Also as a bonus there are some weak inquest walking about if you need inquest slayer, not alot though. Wind riders, Mount milestorm under Avernan waypoint theres event where you can grab essence gun and 2 shot wind riders, theres plenty of them and respawn rate is awsome! 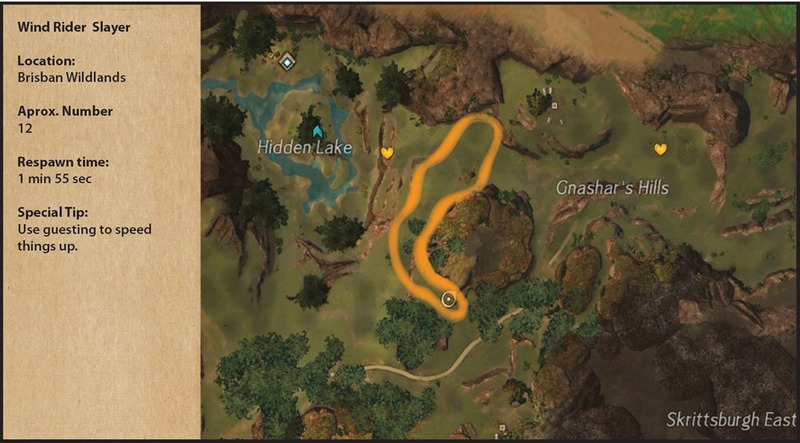 The event doesnt seem to be anywhere near the windriders location or? Couldnt find the gun, but there are still probably more than elsewhere and easy 2 kill. 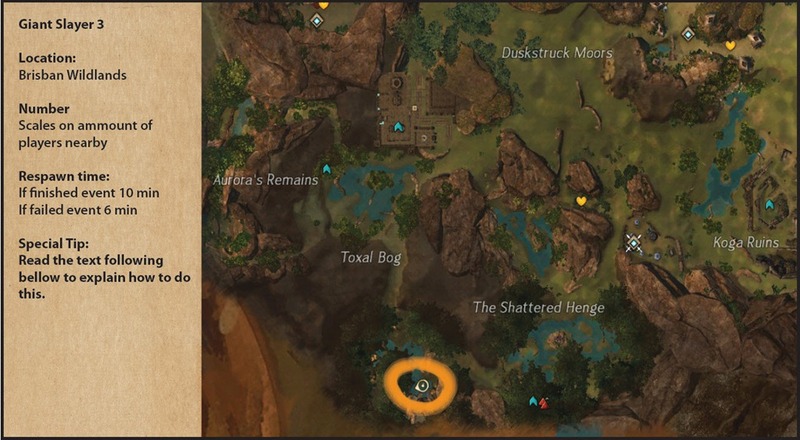 I went with your call on the shell slayer but there is a place in metrica from the old golem factory wp to jeztar falls wp littered with the level 1 crabs. These crabs could also help you get the indiscriminate killer slayer achievement done at the same time. 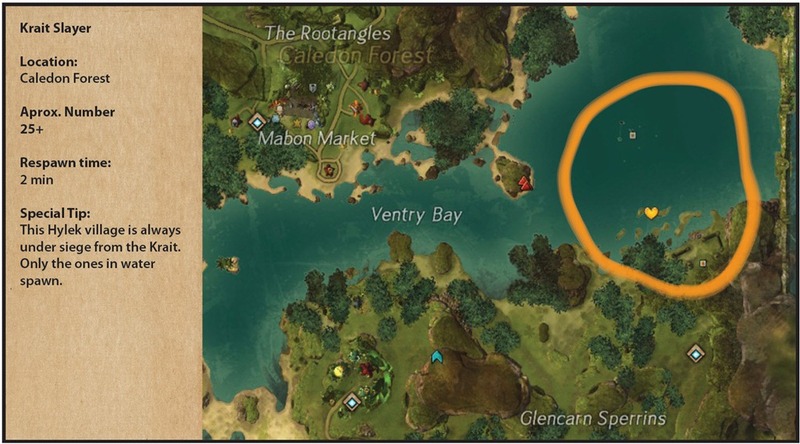 I found the best place for Skelk is the bottom of Shaman’s rookery in Wayfarer’s. You can run a figure 8-ish path mobs will almost always respawn before you finish another loop. An added bonus, is that they die to ~3 hits with a Guardian staff, which means you can just run around spamming 1 and kill stuff on accident. 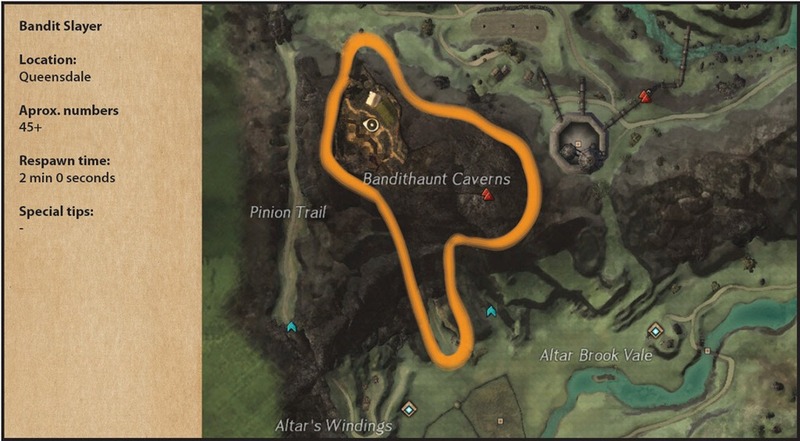 In the low level grawl slyer area there is a cave which does an event fairly often, can get you 30-40 kills in about 30secs with enough aoe. I wanna update your indiscriminate slayer for faster progress, if thats ok. I know a good spot for oozes. Outside Shire of Beetletun there’s the water. In the very southernmost part is a pipe you can enter. I didn’t count how many oozes, but it was definitely ooze city. The pipe goes up the hill and comes out in Beetleton Waterworks. When I came out I went back down to the entrance in the water and they had already started respawning. Took all of a minute or so to blast through there as an 80. This was posted a while back, the said person could have quit the game. They are located on EU servers so I have no contact with them. There are some guild for giant slayer on NA servers today? 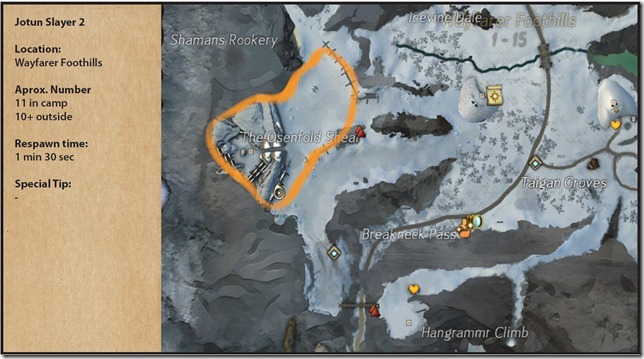 For anyone like me, who didn’t get Elemental Slayer by just playing the game, Icegate waypoint in Gendarran fields is a great spot to farm ice elementals. These are useless for new people because the screen shots are made wrong and old players already done it so why you lost so much time :)? Husks don’t count as plant slayer. I’ve killed many and my count doesn’t change. It seems that Giant slayer has been removed from the game. It’s still in the game. It’s on my watch list currently, which I reset to show dailies. Thank you for updating the slayer Info! 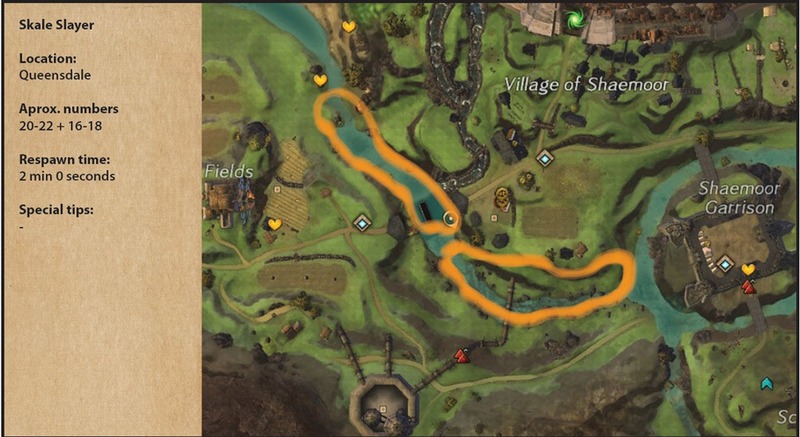 For ooze slayer, the tunnel on the Beetletun waterworks just southwest of Beetletun has a ton that you can kill as you run down the inside. They respawn pretty fast and there’s about 25 per run that you can murder. The easiest to describe entrance is found at the southern edge of the lake by Beetletun. There are a few toxic ooze around the entrance so you can’t miss it. Just go into the tunnel to keep slaying a veritable rainbow of oozes. I found bomb engineer to be perfect for running along the tunnel blindly blowing the crap out of everything. I tried the original post here with the vets spawning oozes but people come along and kill the vets. I tried the Beetletun waterworks and it works pretty well. 20 per run. after 1 run through the pipe then I run back to the start by going outside the pipe, so it is 20 every pass through since they’ve all respawned by the time you get back to the start. 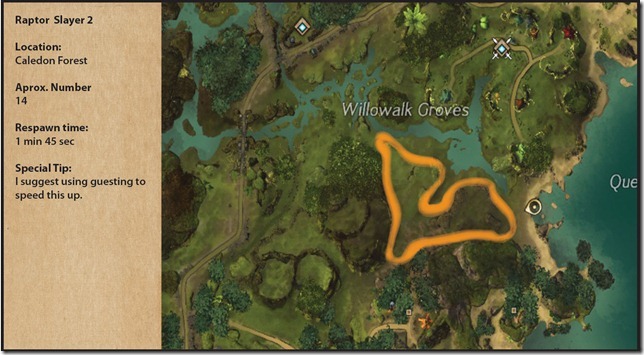 I’m looking to try to finish Giant Slayer Achievment before the mega server changes how you can farm the brisbane wildlands event. The giant at the end of CoE story counts too. 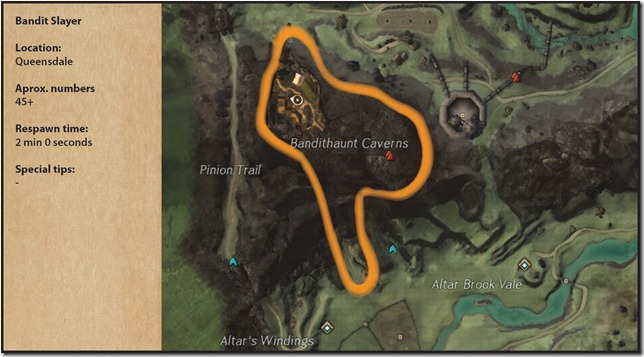 A good alternate to add could be Blackwing Excavation in Fields of Ruin? 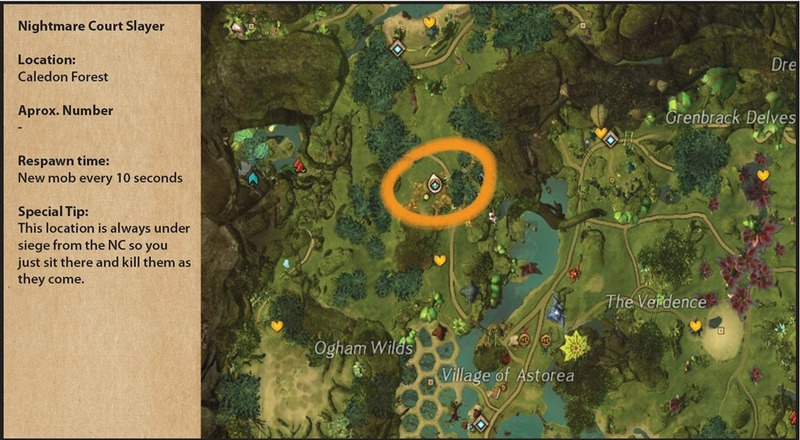 Has anyone verified if the plant-like creatures in the new Living Story count as ‘plants’? If so, perhaps that should be mentioned in the guide as that is currently fairly easy to get. While this is a good guide I’m a bit annoyed at some of the entries that say ‘just play the game’ or ‘just do CoF’. Giving alternative options would be helpful. 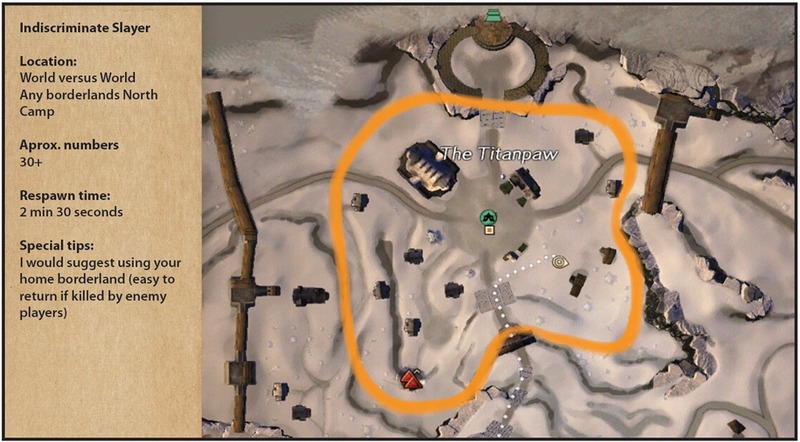 a sweet place to farm the fish achievement, instead of CoF, is the Old Golem Factory waypoint in metrica province. go south down the river and its like 25+ barracudas (i always lose count). all level 4 so its really easy 🙂 wp back and they should be respawned. 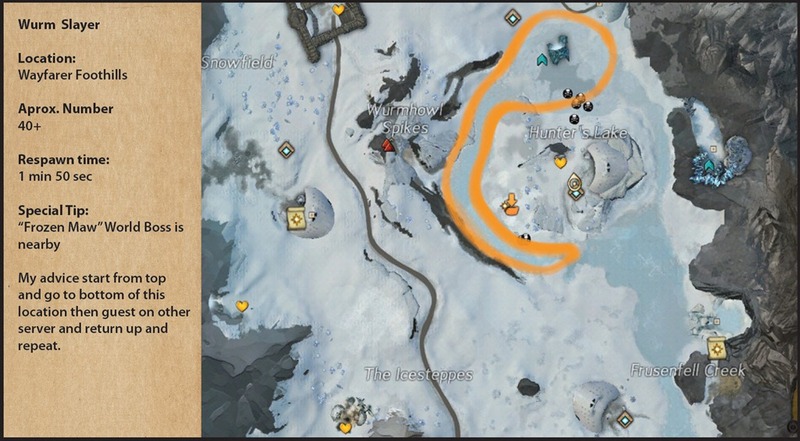 Owl’s Abattoir in Snowden Drifts near Owl Lodge, has level 19 bats with very fast spawn. Aprox. number 15+. 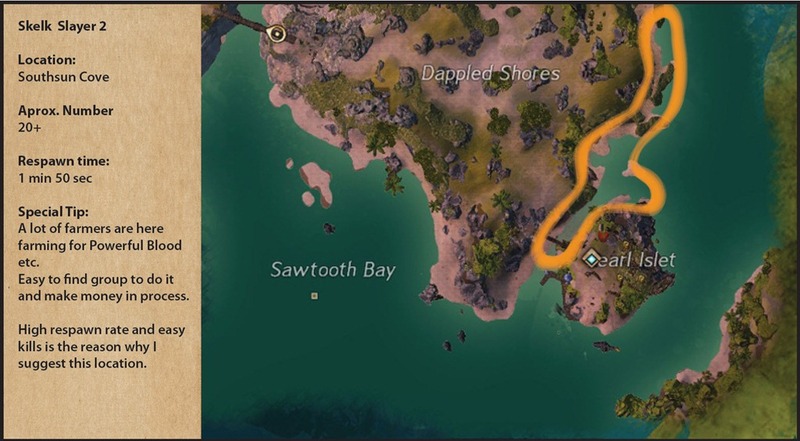 Shell Slayer: I started off trying to do the crabs around the Soundless isle in Caledon forest like you suggested, however once I knew (from your article) that critter crabs also count for this, I found that wandering around the north beaches in Southsun Isles was actually a far better place. 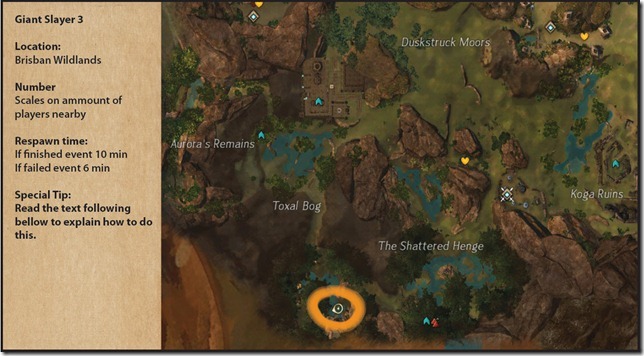 You can completely avoid Karka if you have a bow, and the respawn is so fast that I never ran out of the one-hit crabs to kill. Got this slayer from 76%-100% in maybe half an hour.